In order to write a review and rate you must first be logged in. Click here to create an account if you do not already have one. Click here if you do have an account. Are you ready to face off against dark creatures of the night? In a world where werewolves lurk the shadows, heroic vampire hunters put their lives on the line to hunt down these crazed beasts and protect the populace. Set in a gloomy, Victorian era town, werewolves and hunters fight and fill meters on the side of the reels – while decreasing the meter at the top, all of which lead to specific features. Some of the bonuses can also be won by collecting Scatters. As far as symbols go, you have a diamond, a spade, a clover and a heart, as well as a silver bullet, a potion, a bear trap and the werewolf. A golden Wild symbol acts as a Wild, while the two hunters act as Scatters. Yggdrasil was founded in 2013 by former NetEnt CEO Fredrik Elmqvist, utilising the popular Scandinavian mythology for their imagery. It feels like just yesterday they were the new kid on the block, but now, five years later, Yggdrasil entrenched themselves into a solid position. Their slots are always of the highest quality, and each one is clearly crafted with care and affection. The company has licenses in Malta, Great Britain, Gibraltar and Romania, and recently picked up prizes for Innovation in RNG casino software at the EGR awards and Innovator of the Year at the International Gaming Awards. The title has a 5×3 playing field with 20 fixed paylines, with the meters sitting on the left, right and top of the reel. You can adjust your bet by pressing plus and minus at the coin value button. You can bet between $0.10 up to $100 per spin, which is a wide range that should appease casual players and high rollers alike with its offering. 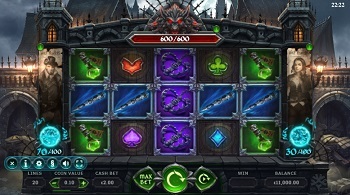 Yggdrasil offers a simple and barebones version of an autoplay, allowing you to select how many spins you will do – while the actual options, such as stopping for a win over a certain threshold, if your cash increases or decreases past a certain amount or when you hit free spins, are actually hidden away in the settings and need to be dug up to be adjusted. Honestly, we may just be suckers for the gloomy, Victorian theme, but this is one of the best looking games we’ve had the joy of playing. The one thing that feels kind of weird is that the reel looks weirdly zoomed in. We’re not sure exactly how to explain it, but it just nags away in the back of our heads, ruining what’s otherwise one of the more gorgeous titles we’ve seen. 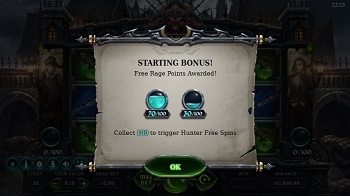 Collecting the two hunter Scatters on the first and fifth reel will activate regular free spins – ten of them, in fact. Hunters have a better chance of winning duels with werewolves during the free spins. 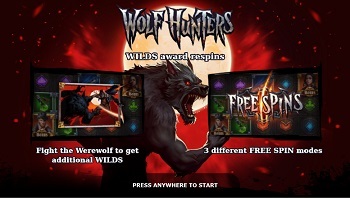 You can power up the hunters by collecting three bonus symbols in free spins – successfully powering them up rewards two more free spins, and all Wilds spawned from hunting werewolves can expand either to the left for the hunter, and up and down for the huntress. If you fill up one of the two meters on the side of the playing field, you’re rewarded the same 10 free spins bonus, and the hunters already start empowered. 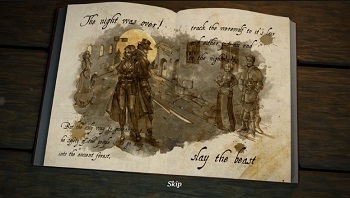 Finally, each time the hunter wins a duel against a werewolf, the large health bar above the reels is lowered. 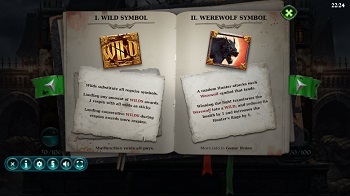 Once it drops to zero, all werewolf symbols immediately become expanded Wilds for the duration of ten slayer free spins. The largest possible win you can get is 2500x the wager. The title is a medium to high volatility slot, which means the features can be rare to appear, but their wins are fundamentally more valuable as a result of their rarity. The bars which you fill up or deplete over time also reward long-term commitment to the title, which can be a bit costly given its volatility. The game has an RTP of 96.3%, which is above average for video slots. We’ve gotten used to Yggdrasil delivering quality slots, and they’re succeeded in doing so yet again. An awesome, slightly creepy theme, fun gameplay that rewards long-term commitment, and awesome pays that make it all worth it – overall, we’d recommend giving Wolf Hunters a try. That said, if you don’t have patience and money to invest, you might be better off looking for something with less volatility.